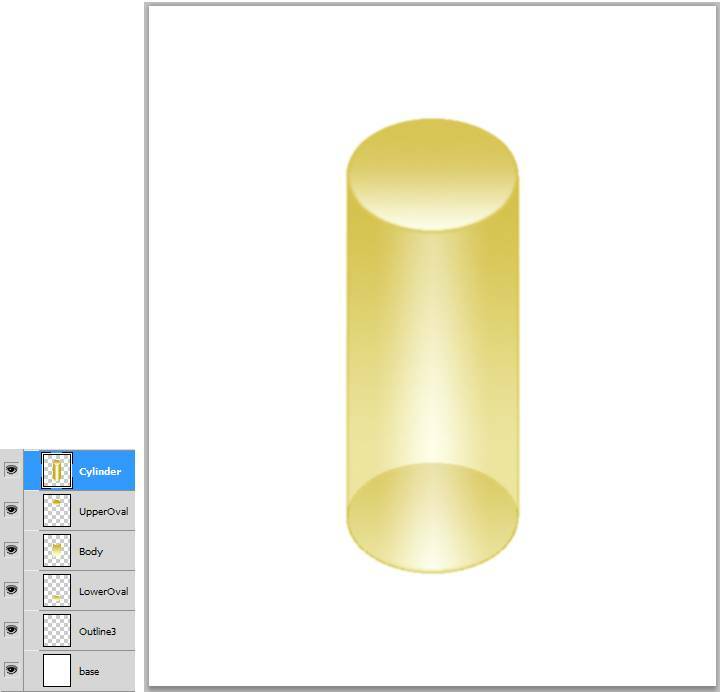 In this tutorial, you will learn to make Cylinder primitives in Photoshop. 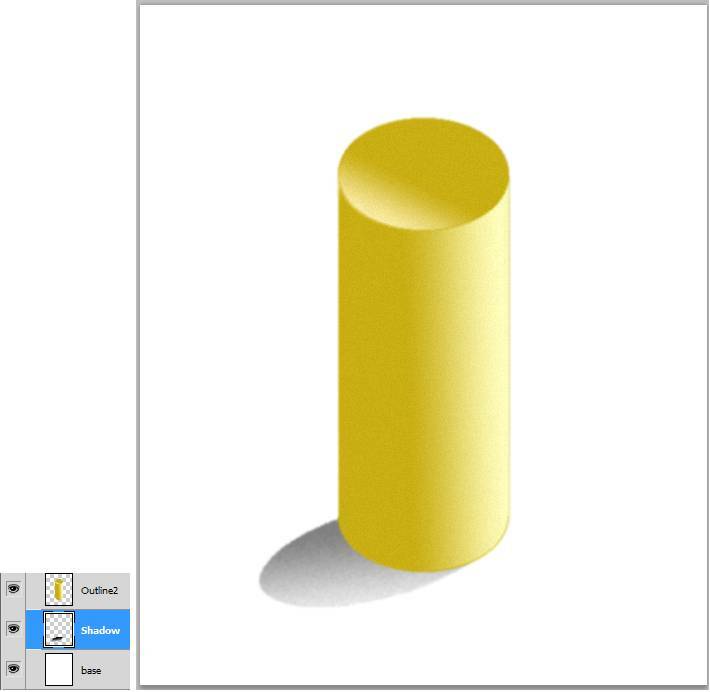 You could hand draw and paint a Cylinder if you are a good artist, but by using gradients and outlines, you can create realistic images with depth. 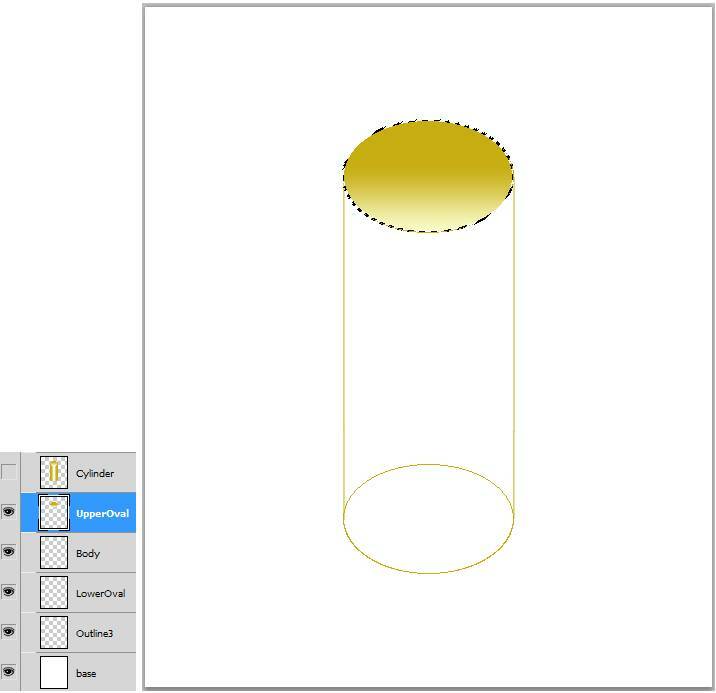 To make the Cylinder, use the Line and Elliptical tools to create the outline. 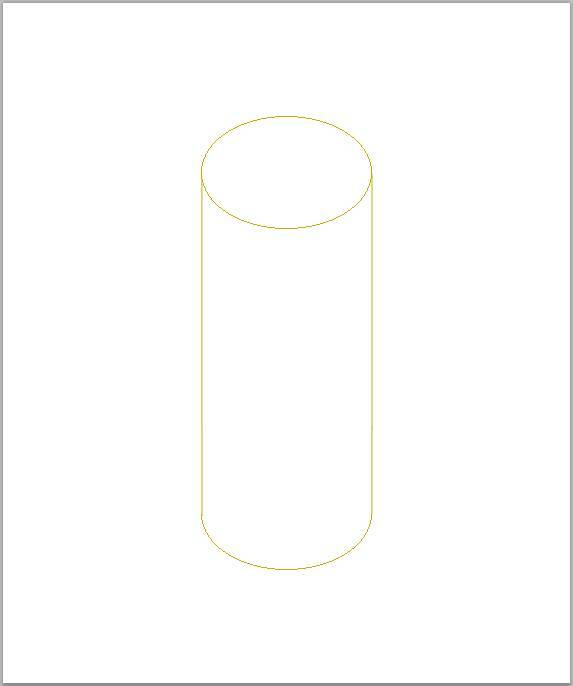 Linear and Reflected Gradients are put to good use in making the cylinder stand out. Change the gradient direction on the Cylinder and add a shadow for a more convincing view. 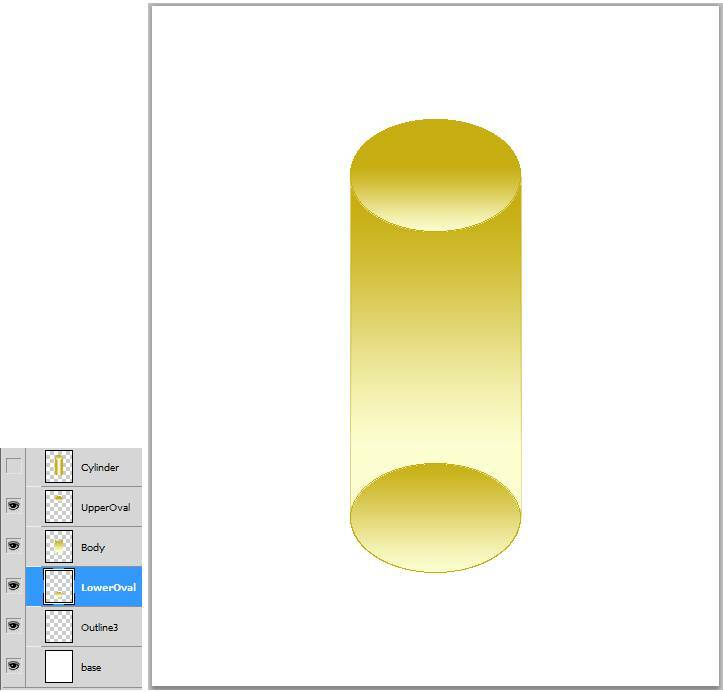 The shadow version is made of just two Linear Gradients for the cylinder, and the shadow selection is rotated and stretched by using Edit/Transform from the menu. The transparent version uses the original Cylinder layer and three layers of Linear Gradients. The Opacity is turned down on all three layers to bring out the transparency and depth. Open a new project in Photoshop, 20x24cm square, and fill with white. Name it Base. On the menu, go to View/Show/Grid. Go back to View and check Snap. Change the foreground color to yellow. 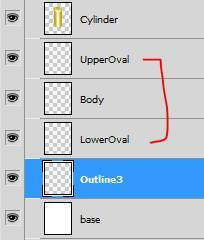 Create a new layer called Outline1 above the base layer. Turn on the grid and use the Elliptical tool to draw a top and bottom selection. Stroke both these selections. 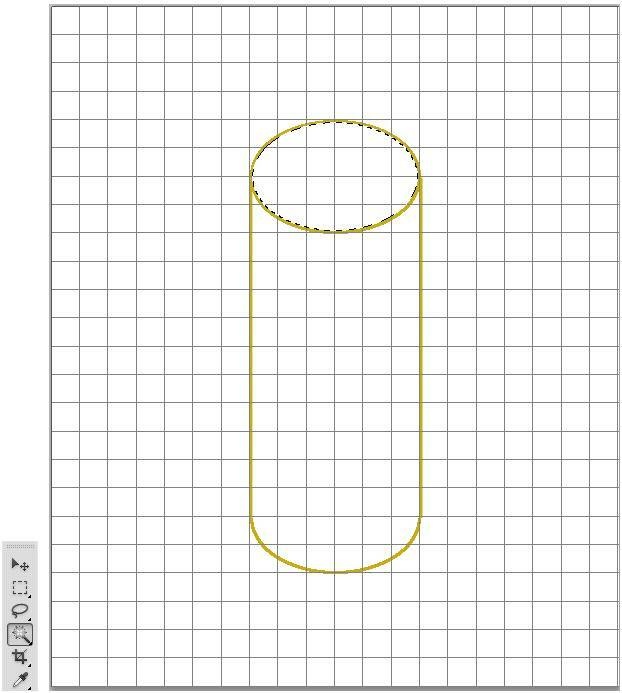 Then delete the bottom top half and use the Line tool to complete the cylinder outline. Click on the Magic Wand Tool. Check Contiguous. Click inside the top oval to get the selection. Go to Gradient and click Linear Gradient. Then click Reflected Gradient. and create a horizontal gradient. On the Outline1 layer, go to Filter/Noise/Add Noise.Then to Filter/Blur/Blur More. Turn off the Grid. Create a Base and Outline2 layer. Make the same outline, but a 1 pixel size Stroke. 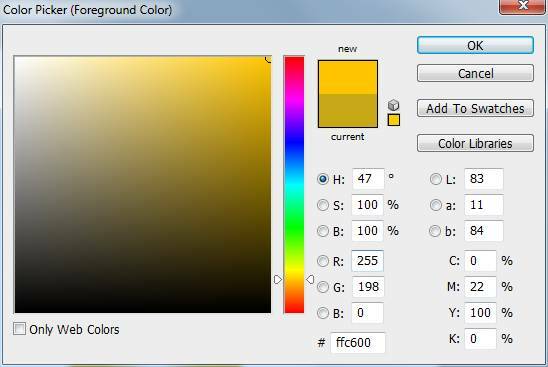 In the Gradient Editor, change the right side color so it ends in a light yellow. 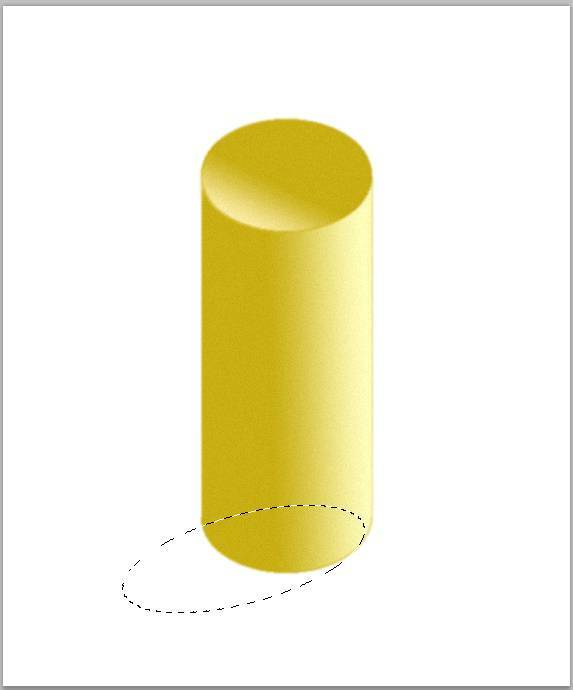 Follow the same steps as above, except use Linear Gradient for both top and body of the cylinder. Remember toFilter/Noise/Add Noise . Then to Filter/Blur/Blur More. For the shadow, create a new layer above the Base layer. Name it Shadow. Click on the Elliptical selection tool. Draw a selection next to the cylinder. Right click inside the selection and in the popup menu, go to Transform Selection. Now we can Rotate and Stretch the oval selection. On the menu use Edit/Transform, or do it freehand with small pointers that show around the eight square points. When you are done, it will look like below. Change the gradient to a grey one. Choose Linear Gradient. Stay on the Shadow layer and draw the gradient inside the oval selection. Go to Filter/Noise/Add Noise. Now toBlur the Shadow layer. Go to Filter/Blur/Blur More. Bring down the Opacity of the shadow layer until it looks right. Create an Outline3 layer and a Base layer. Create the ovals and lines. 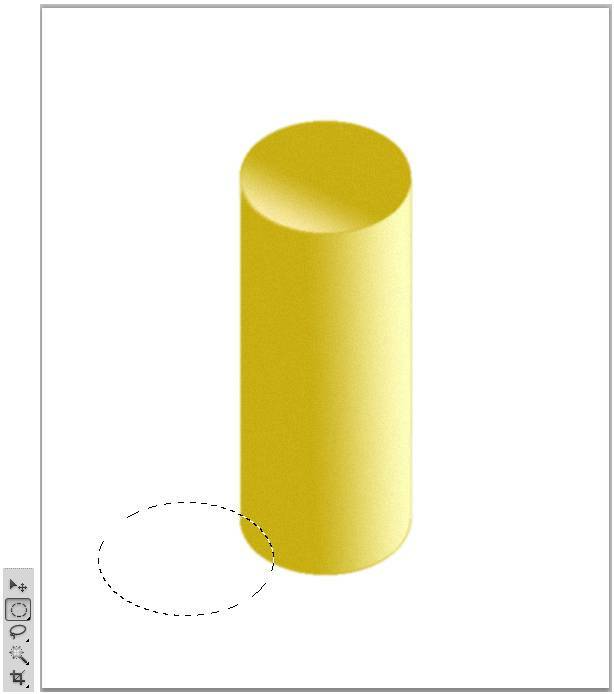 This time don’t delete the top half of the bottom oval. Merge down the line layers into the Outline3 layer. 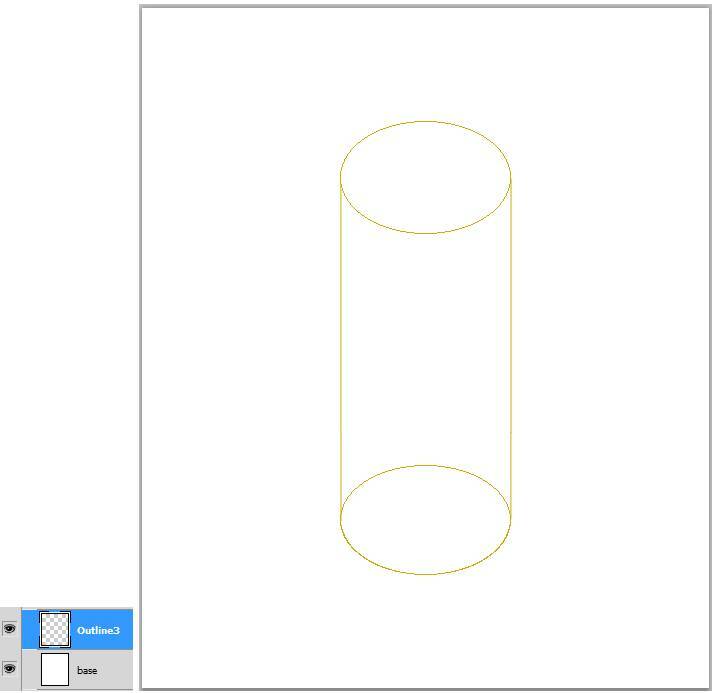 Put your original finished Cylinder above the Outline3 layer. 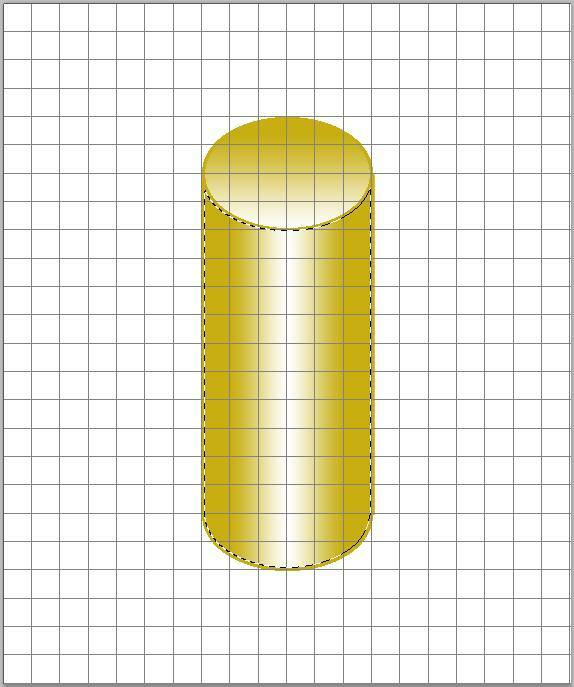 Add three new layers, UpperOval, Body, and LowerOval in between the Cylinder and Outline3 layers. 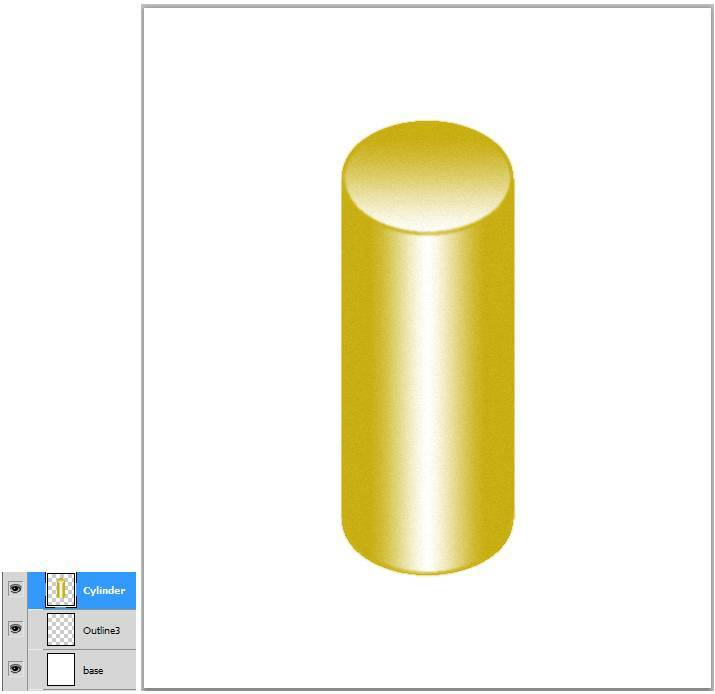 Go back to the Outline3 layer and use the Magic Wand to click a selection of the top cylinder. 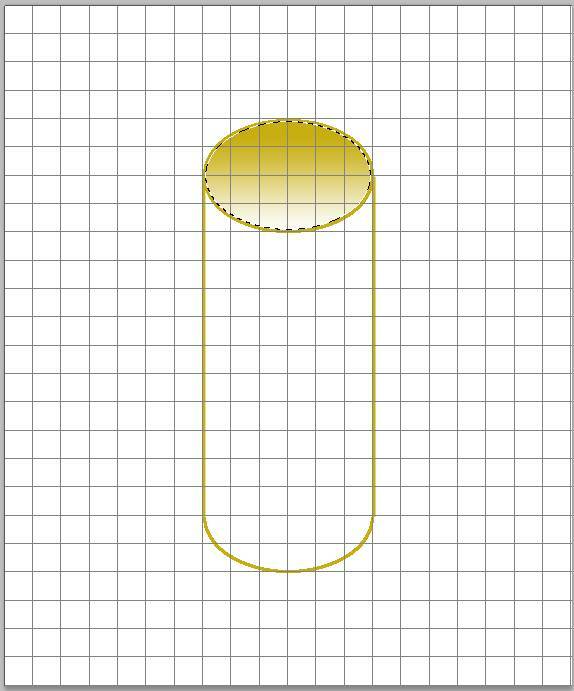 Then go to the UpperOval layer and create a Linear Gradient like below. Repeat the above steps using a Linear Gradient for the Body layer and LowerOval layer. Blur the UpperOval, Body, LowerOval and the Outline layers. Turn on the Cylinder layer, and bring down the Opacity of each layer until it looks right.